Institute defeated Carrick Rangers 2-1 to ensure at least a Premiership promotion/relegation play-off place. The north-west side are second in the Championship while third-placed Carrick are now out of promotion contention. Institute are a point behind Bangor, who have turned down the chance of going up to the top-flight. If Institute finish top after the final games on Saturday they will be promoted while a second place finish will secure a play-off with Ards. Tuesday night's result at Taylor's Avenue also brings relief to Ballinamallard United and Warrenpoint Town, who now avoid a possible play-off and retain their Premiership status. Ben Roy put Carrick ahead but Michael McCrudden levelled before Stephen O'Flynn scored an injury-time winner. 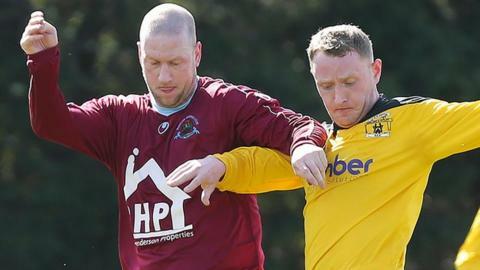 Institute will host Limavady United on Saturday while the Seasiders, who beat Lisburn Distillery 6-2 on Tuesday night, play H&W Welders at Clandeboye Park.